Madison Coupon Connection: Use Coupons to Help Special Olympics! Save money and make a donation to charity at the same time! In this next Sunday's paper (12/26), there will be only one coupon insert, Procter & Gamble. 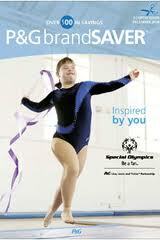 It's a special insert, this week, however, because P&GbrandSAVER® will be donating 3 cents to Special Olympics for every 12/26 P & G insert coupon that is redeemed! Visit pgeverydaysolutions.com for more information.